What I propose is that dialogue should take place among cultures and civilizations. And as a first step, I would suggest that cultures and civilizations should not be represented by politicians but by philosophers, scientists, artists and intellectuals. What I propose is that dialogue should take place among cultures and civilizations. And as a first step, I would suggest that cultures and civilizations should not be represented by politicians but by philosophers, scientists, artists and intellectuals.[...] Dialogue will lead to a common language and a common language will culminate in a common thought, and this will turn into a common approach to the world and global events. از کتابِ « احزاب و شوراها ، نشرِ طرحِ نو ، ۱۳۸۸ ، ص ۲۰. We believe that Hizbullah has an authentic Lebanese identity. We love Hizbullah. I emphasized this in talks with Mr. Chirac, who said he has never called to weaken or disarm Hizbullah, and on that matter he is in disagreement with some of his European allies. Hizbullah will remain and keep its weapons. Said in a message to Hezbollah’s leader Hassan Nasrallah that “Hezbollah is like a shining sun which warms up all oppressed Muslims, especially those in Palestine and Lebanon”.**http://www.nytimes.com/2006/07/19/world/middleeast/19iran.html.**http://www.asianews.it/view.php?l=en&art=6726.**http://www.iht.com/articles/2006/07/18/news/iran.php.**http://www.iranfocus.com/modules/news/article.php?storyid=7960. Offending and insulting, is different from expressing an opinion that can be analyzed, argued on, and can eventually be accepted or rejected [therefore offending others is not acceptable] … But in addition to the west, we ourselves also have problems in this regard. Instead of logical criticism or debate, we only keep saying offensive things about liberalism, democracy and modernism. I had told some of our elders before, that the religion of the today's world is 'liberalism' and we have no right to make insults about it. We should not keep using phrases such as "the corrupt culture of the west" etc. in our words. As it's also said in the Holy Koran, "Do not insult the gods of others, otherwise you are indirectly insulting your God". February 15th, 2006, during a press interview in Tehran's airport upon his return from a cultural conference in Malaysia. ...the policies that the United States has chosen unfortunately have brought about the wrong sentiment toward the United States and has only increased, and will only increase, extremism in our region. Of course we may assume many general and non-historical meanings for secularism, but turning a subject that is in all its existence a historical matter into a non-historical matter is a blatant mistake. (Berlin Institute of Advanced Studies, Nov 2005). On the Dialogue Among Civilizations and Political ethics. On Saddam and the Death Penalty. I don't like the death penalty, although if there is one case where there should be an execution, the fairest case would be for Saddam. But I would never wish for that. On Shirin Ebadi and Nobel Peace Prize. "Must I always send a message for everything," when asked why he had not responded to the award for Shirin Ebadi, the first Iranian Nobel Prize winner, four days after it was made. "The Nobel Peace Prize is not very important, the ones that count are the scientific and literary prizes," he added. 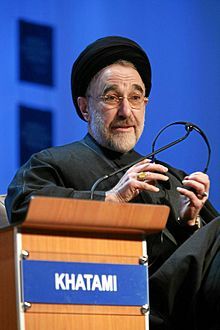 However it seemed in those early remarks, Khatami was trying to reduce conservatives anger over Shirin Ebadi, who wore no hijab while accepting the prize in the ceremony, because later Khatami in an interview reported by Iran press service.com () on December 12, 2003 said: "The Nobel Prize is very important in all domains; it is obvious that every Iranian must be proud to know that another Iranian, especially an Iranian woman, got this Prize. This said, more important than the prize of the peace is peace itself. Our world is a world of war, a world of terror and violence, a world of illness and famine, a world of discrimination", he replied when observed that the welcome reserved to the laureate in Iran was "tepid". "Politic is always an important factor. She continues her work, a work that, I hope, she would be able to pursue freely in Iran. I also know that she had some problems"
On Pope John Paul II. Pope John Paul II was a seeker of truth, justice and peace. Pope John Paul II was a disciple of religious mysticism, philosophic deliberation and thought and artistic and poetic creativity, By emphasising his experience and teachings, (he) earnestly tried to utilise them in the path of the triumph of truth, justice and peace. It is hoped that the leadership of Catholic Christianity, by following the teachings of the Prophet Jesus, may peace be upon him, by interacting with justice seeking and peace loving political-religious leaders and by also following the ethical and humanitarian thinking of John Paul II, help the world towards a better and more just life. On Terrorism and 9/11 Attacks. Terrorism, which means killing civilians in whatever name or title, lacks morality, and nobody who lacks such principle will go to heaven. In response on the motives of suicide bombers, he said that, Those who put others through hell will never go to heaven". This page was last edited on 5 March 2018, at 23:59.